It appears home prices are rising too much, too fast, if the latest report from ATTOM Data Solutions is any indication. The company noted that 22.8% of single-family home purchase loans originated in the second quarter of 2017 included a co-borrower. ATTOM defines a mortgage with a co-borrower as one with multiple, non-married borrowers listed on the mortgage or deed of trust. Think mom and dad. The share of co-borrower purchase loans was up from 21.3% in the first quarter and 20.5% a year earlier. ATTOM Data Solutions senior vice president Daren Blomquist noted in the release that home buyers are increasingly using co-borrowers to qualify for mortgages, especially in competitive higher-priced markets. In short, even if the lender only requires 1% down payment for a mortgage, a bidding war might mean that you need 20% to win over the seller of the property. Blomquist added that the rise in co-borrowing is increasing purchase loan origination volume, despite affordability and supply concerns. Speaking of, dollar volume of purchase loans in the second quarter totaled nearly $257 billion, a massive 67% jump from the previous quarter (it’s seasonal) and a seven percent increase from a year earlier. That pushed purchase volume to its highest level since the second quarter of 2007 — a 10-year high. It’s doubly impressive seeing that limited housing stock is hindering sales, and low mortgage rates are reducing mobility. The biggest YoY gainers in purchase mortgage origination volume were Fort Wayne, Indiana (up 38%), North Port-Sarasota-Bradenton, Florida (up 25%), Indianapolis, Indiana (up 24%), Des Moines, Iowa (up 22%) and Tampa, Florida (up 21%). The biggest decliners were Flint, Michigan (down 33%), Raleigh, North Carolina (down 32%), Charleston, South Carolina (down 26%), Lexington, Kentucky (down 23%), and Santa Rosa, California (down 22%). Of course, it wasn’t all rosy – mortgage refinance volume plummeted 32% in the second quarter from a year earlier, despite a one percent uptick in the linked quarter. We’ll see if the recent drop in rates can lead to a resurgence in refinance activity. 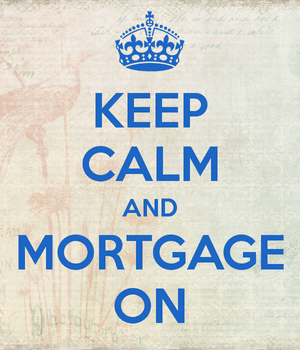 It’s already being seen in the Mortgage Bankers Association’s weekly application figures. Perhaps unsurprisingly, the city of San Jose had the highest share of co-borrowers at 50.9%. Home prices there have skyrocketed, making it difficult for a single borrower to qualify DTI-wise. It was followed fairly closely by Miami, Florida (45.2%), a housing market that has rebounded strongly in recent years. Rounding out the top six were Seattle (39.1%), Los Angeles (31.1%), San Diego (29.4%), and Portland, Oregon (28.8%). 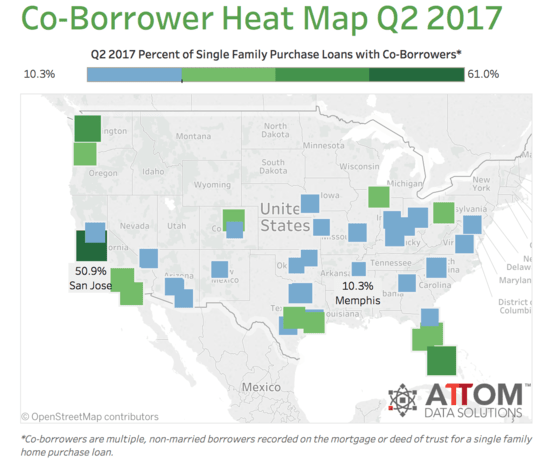 The lowest share of co-borrowers during Q2 were found in Memphis, Tennessee (10.3%), Mesa, Arizona (12.5%), Oklahoma City, Oklahoma (14.2%), Gilbert, Arizona (14.4%) and Henderson, Nevada (15.1%). Home prices in those cities seem to be reasonable enough to allow one borrower to qualify for the corresponding mortgage. Must be nice. If it sounds like folks are stretching themselves too thin, consider the fact that the median down payment hit its highest level since the third quarter of 2014. That means most borrowers have a decent amount of skin in the game, which is a good default deterrent. They won’t want to give up all that equity, even if home prices do slide in the future. The trend of larger down payments and use of a co-borrower is reducing the use of government mortgages. Both FHA and VA loan volume were down year-over-year in the second quarter, as home sellers aren’t too fond of those types of loans if a conventional loan with a healthy down payment is the alternative.